Hometown: Tipp City, OH. Raised- Kennesaw, GA. Playing Background: Liberty University. Career leader in assist all time for Liberty. Education: M.A. in Health and Physcial Education, Augusta State (2007), B.S. in Sport Management, Liberty (2000). Coaching Education: NSCAA Director of Coaching Diploma, NSCAA Premier Diploma, USSF "B" License. 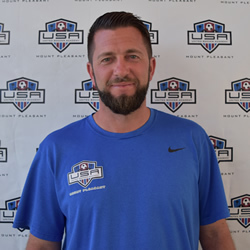 Coaching Experience: Director of Coaching/ Director of Soccer Programs: USA/MP (since August 2008- present), Trainer- Augusta Arsenal Soccer Club (May 2001-July 2007), Director of Soccer- Westminster Schools Augusta (August 2001-May 2005). Club Accomplishments: 94 Boys Elite- U14, U15, U16 State Runner Up, 96 Girls Elite- U13, U14, U15 & U18 State Champions, U14 Region 3 Quarterfinals, U15 Region III Premier League East Champions. 98 Girls Elite- U15 & U16, U18 State Champions. 03 Girls Premier- U14 State Runner Up. Favorite USA/MP Moment: Winning the third State Championship in a row with the 96 Girls Elite! © United Soccer Academy Mount Pleasant. All rights reserved.